I forgot how much I love nettle tea! It has a full-body flavor like black tea without the tannins. Iron-rich, nettle tea also makes a wonderful addition to any vegetarian soup stock.Why do nettles sting? The fragile, hollow hairs are filled with histamine and acetylcholine. Touch them and the contents spill out. Harvest them with gloves or even heavy plastic bags. In my younger days, I was so enthusiastic to pick this plant that a few times I did it with bare fingers! The tips of my thumb and forefinger remained numb for days. I have since learned if the urge to harvest is irresistible I can pinch the young plant below the soil surface to avoid getting stung. Needle-like tiny hairs cover the stems and back of leaves. Illustration from Biology of Plants, Peter Raven, Ray Evert and Helena Curtis, 1976. 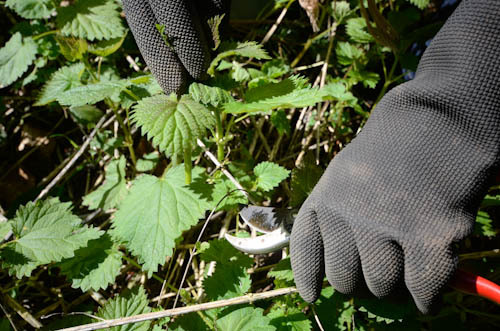 Don’t pick nettles near agricultural fields grown with chemicals because the plants can accumulate the nitrates and heavy metals. The woods around Port Townsend are full of this wickedly wonderful plant. Nettle helps alkalinize the blood, and is high in all kinds of minerals. The most nutritious way to consume it is juiced. Try freezing the juice in ice cube trays and storing in bags. Harvest leafy stems up until flowering in summer. 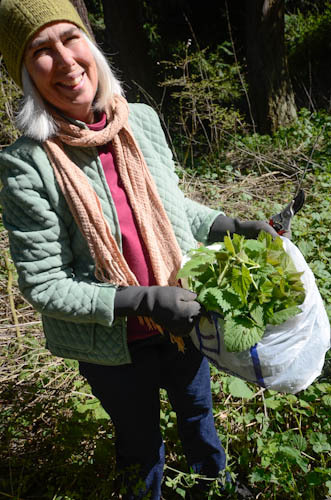 Drying Nettles: Remove the dried stems and store the leaves. While the leaves no longer sting, the rough hairs can still scratch.